Housed within a dust and water-resistant protective aluminium sheath, the drive incorporates a built-in rechargeable battery to power the keypad and is ready to use out of the box, without the need for any software to be installed. The tamper-proof drive is compatible with Windows, Mac, Linux, Android and embedded systems, and features real-time drag-and-drop encryption. To use it, simply enter the PIN and insert the drive into your device. Two LED lights indicate that the code has been accepted (or not) and, once done, your content is automatically re-encrypted on removal of the drive. If you forget your PIN there’s a reset function that destroys the data and creates a new randomly generated encryption key to allow the drive to be reused. In addition, a built-in ‘Brute Force Hack’ defence mechanism wipes the contents if the incorrect PIN is entered 10 consecutive times. The buttons are, by necessity, quite small and require a firm press, but the use of an on-device keypad makes it more secure than using the computer’s keyboard to input passwords. The encryption process adds no time penalty – it takes no more than a second for stored data to be unencrypted. The iStorage datAshur is available in capacities from 4GB (£46.80) to 32GB (£118.80). Use the alphanumeric keypad to enter a 7 to 15-digit PIN code of your choice. LED lights confirm the lock/unlock status of the drive. 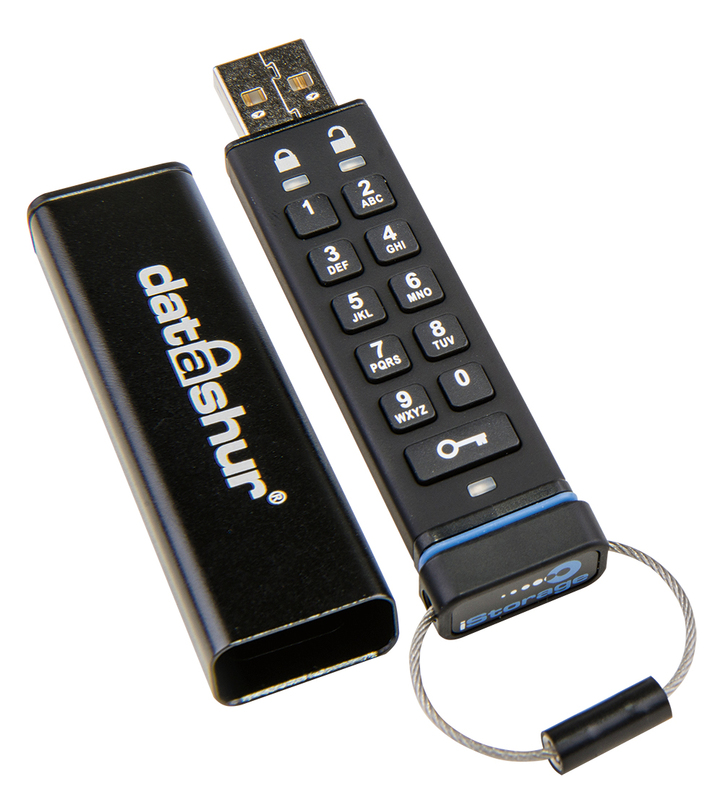 The datAshur offers military-grade 256-bit hardware encryption for maximum security. The rubberised drive feels solid and well made, but for extra protection it comes with a rugged aluminium sheath that is water and dust-resistant. 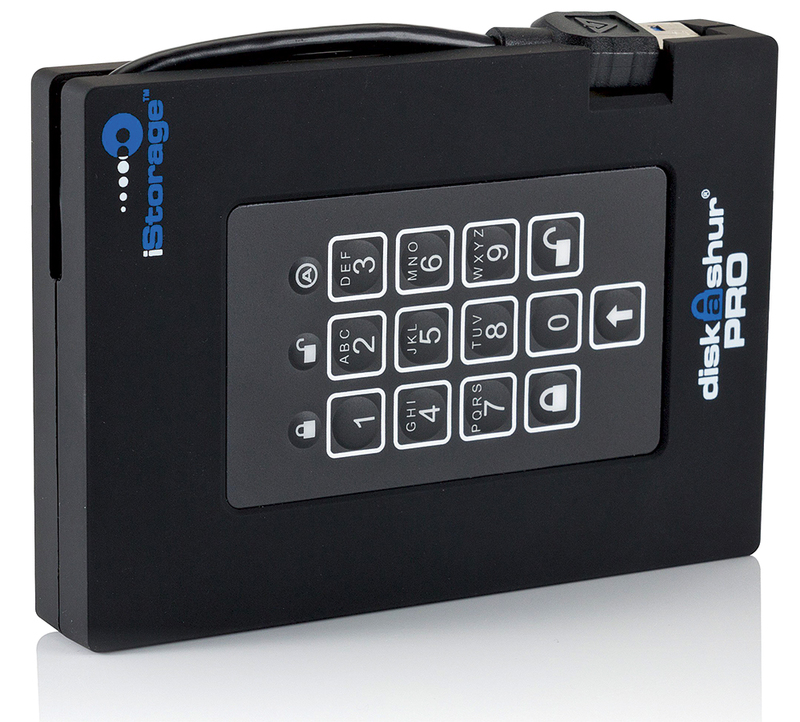 iStorage also offers a range of similarly encrypted storage solutions in various sizes and capacities using both SSD and HDD technology. The larger diskAshur PRO (right) is available in sizes from 500GB (£250.80) to 2TB (£394.80), and works in the same way as the datAshur. Handily, for those whose fingers may find the datAshur’s keypad just a little too fiddly, it features a larger keypad that is also dust and water-resistant. As a bonus, it comes with an integrated USB 3.0 cable and as well as its own useful travel pouch.